Baby socks make for a baby finish! 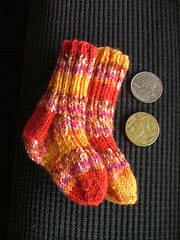 Got around to knitting up the second baby leftovers sock to make myself a pair. With a rather impressive stroke of luck I managed to even match up the stripe patterning too so they make a really cute pair! A fraternal pair, maybe, but a pair non-the-less! They are so cute and bitty! Look! Truly multi-cultural size comparison! That's an American quarter and Australian dollar coin. They make me happy, and I knit them for no real purpose. They're a horribly inconvenient actual baby garment since the wool is 100% wool and certainly isn't anything that can just be tossed into a washing machine, but they do make pretty, warm socks. If anyone has or knows anyone with a baby that could use inconvenient (yet cute!) socks, just let me know. Monkeys are coming along just fine. Hopefully will be finished with the first one tomorrow, I imagine! But this might mean there'll be hope in sight for my various attempts at sweaters I've started. ^_^ It's all in the yarns, they are beautiful aren't they? 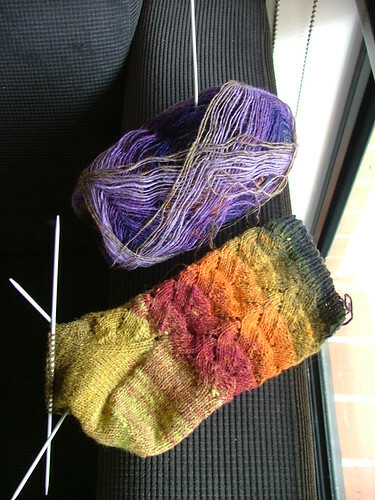 Yeah, so far I'm really pleased with how the Noro's knitting up, it's deceptively sturdy! I can't wait for the silk-garden lite version of the sock yarn. I LOVE Ranco sock yarn, I've got two socks knit out of it now and they're so comfy and warm. Can't wait to see how your monkeys will come out!